I’ve been feeling a pang lately, a sharp poke, a prod — whenever I hear about my former bandmates and other musician friends recording, playing shows, forming other musical projects. Like…. like I miss playing music I suppose. Like I miss being on stage once and awhile. It’s been a long time since this photo was taken (ten years or so) at the Ukranian Hall in East Van – midway through the Flying Folk Army’s eight years of playing together. While we had many years of good times and close friendships, the band was also a lot of work (booking gigs, rehearsing, the whole music scene process) and as we slowly drifted apart and into other areas of our lives, it seemed fine to me to have a bit of a break from it all. However. If I don’t have a musical project, then I just don’t play much at all – and because my life hasn’t allowed for another project (too busy, too much going on professionally), my fiddle and voice have gotten dusty and rusty. Instead of having some time to fortify, I have allowed my musical self to go fallow. 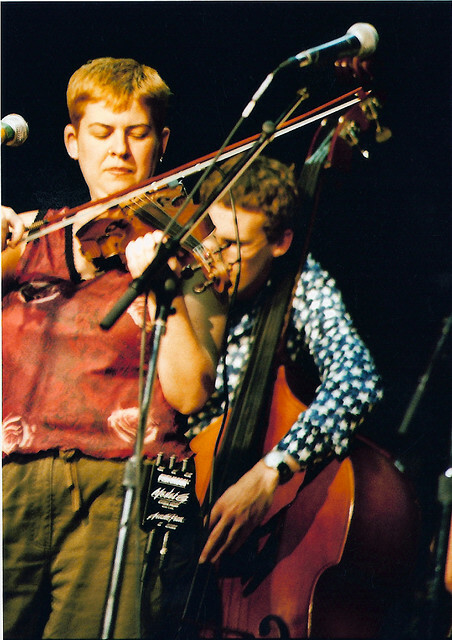 Though Brian helps to nudge me every once and awhile (he is a much more eager player than me), I still find its fits and starts and then I put my instrument down for months at a time – lamenting each time I pick it up at how much my muscular development has suffered in the interim. But lately, I’ve felt a real sense of loss about not playing – and I’m jealous of people who are. I’m jealous of my partner because he is writing music and I am not. And while I know I don’t have time for a full-blown band again, I’m thinking that starting a once-monthly song circle might be helpful to my process – and definitely going out and inculcating myself in open-mic nights and folk gigs again would help to inspire. In the meantime, Brian and I are playing together again – we are working on a set list of ten+ songs and I’m hoping to find some time to write music again in the near future too. I feel hampered somewhat by the fact that my musicianship has never been great – but inspired by the fact that most of my favourite musicians would say the same. I mean – hell – what I really want to be able to do is jam with people regularly and bust out some tunes around the campfire…. So that’s what I need to find my way back to doing. Oh do I feel your pain! I get my musical kicks vicariously (through my kids) these days, and on a certain level it’s extremely satisfying but on another level it’s purely tantalizing.